If you have spotted ants in or around your property and want to get rid of them, you are likely wondering where you should turn for a solution. Knowing the things that attract ants and the areas of your home or office they like to invade will get you on track in no time. Having the right tips in mind as you move forward will enhance your odds of defeating the invaders and reclaiming your home or place of business. You must also learn about the types of ants you could encounter if you want to enjoy the best possible results. As far as these invaders are concerned, you are the most likely to spot odorous ants, or common house ants. These small black insects love sugar and will never waste a chance to get into open bags of food. If you spill a sweet drink and don't clean it up immediately, odorous ants will locate it and use a scent trail to lead the rest of the colony to the tasty treat, and you will have an infestation on your hands. You could spot hundreds or thousands of ants depending on your location and the size of the spill. Since these ants are the most common, you will be pleased to learn that they are harmless to humans. Fire ants are more of a threat than house ants, so you will want to move quickly when you notice signs of an infestation. If fire ants believe you are threatening them or their colony, you will have a serious problem on your hands. Attacking fire ants will grab onto your skin with their pinchers for stabilization before they sting you, injecting a painful venom. The painful sting of a fire ant won't put your life in danger unless you have an allergic reaction to the venom. 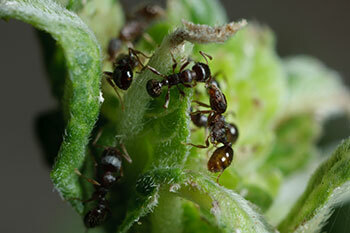 These pests like to build mounds in yards and will come into your home if they spot a food source. You can find them in your kitchen and anywhere else they can get access to a quick meal. Pharaoh ants are another type of insect about which you need to learn when your goal is to keep common invaders at bay so that you won't have to worry about them. While they don't bite, pharaoh ants can carry and transmit harmful pathogens to people, so you will need to get rid of any food they find. Don't be surprised if you see them infesting your kitchen or pantry because they enjoy sweet and sugary foods. What makes these ants a challenge to manage is that they often establish colonies in discreet locations away from food and water sources. Feeling motivated to contain the pests, you take action to kill them and think you have completed the task, but the ants could return if you did not locate and address the colony. Trying to handle an ant infestation with at-home solutions can work, but it won't always give you the outcome for which you have been looking. Turn to the experts at Germantown Pest Control & Termite if you want to teach your ants a lesson they won't ever forget. If you are ready to take action and defeat the ants that have been causing trouble, give us a call right away.